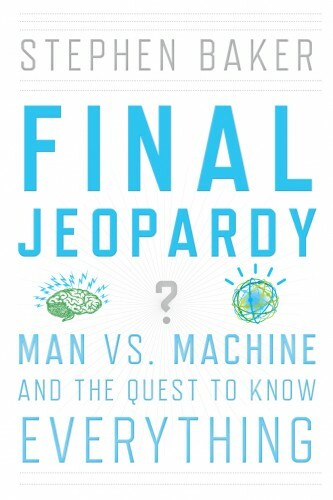 The e-book of Final Jeopardy can be pre-ordered, as of today, at Amazon and B&N--but there's a wrinkle. The e-book that turns up on Jan. 26 will be a partial e-book, with only the first 11 chapters. The final chapter, including the result of the man-vs-machine showdown between IBM's computer and the two human champions, will arrive on Feb. 17 ( following the Feb. 14/15/16 televised match) as an update. USA Today carries the story of the updateable e-book. This shows how with e-books, books can participate in breaking news. Traditionally, when a big event happens, magazines and newspapers produce the drum-roll of anticipation and the early analysis. Books arrive later, usually by several months, with the fuller account. With this book, I'm hoping, many readers interested in the event will have read the entire back story of Watson's development, the machine's towering strengths and gaping vulnerabilities, what it means for artificial intelligence, and so on--and know all of this when they sit down to watch the match on TV. The day after the match, the final chapter will turn up--and the full book will arrive in book stores. I'm thinking that this could lead to new relations between authors and readers. Conceivably, readers could subscribe to updates on the book, or other subjects, through the same channels. If I wrote a related magazine article in the middle of next year, maybe that too could arrive as an addendum. Of course, this is bound to produce some friction. The authors, no doubt, will want to establish a direct connection with the readers. But it will belong, at least in these early days, to the online booksellers. The eBook's final chapter will divulge the winner and analyze the match, and will be available to readers as a free update directly after the event finale airs. But some readers, when they know they want a book, simply click to buy and don't bother with the synopsis. I'd like them to get a clear alert about what they're going to be getting, and when.